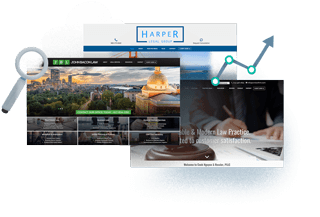 From all things design to all things technical, MyCase builds sophisticated, custom websites so you can focus on building a successful law firm. Our in-house team works with you every step of the way to construct a website that captures the attention of your prospective clients. MyCase legal websites are built in alignment with current web best practices — giving you a competitive edge and a site you can be proud of. With half of internet traffic coming from mobile devices, your site needs to look, and more importantly, function great no matter what screen size. That’s why MyCase legal websites are fully mobile-responsive — the design, navigation, and functions of the sites work flawlessly across phones, tablets, or desktop web browsers. So no matter where your prospects are, a mobile-ready site makes it easy for them to understand why your firm is the right choice. You don't have time to become an expert on domain configuration and web server management. We handle all the details like domain name purchasing, hosting, and backend website architecture so you never have to grapple with technical challenges. Also included in our full-service website service are search engine optimization (SEO), social media platform integration, and Google Analytics to ensure your potential clients will find you online.